Can having high cholesterol levels have an effect on your eye and vision health? Answer: High cholesterol can affect the eyes and vision, and the ramifications can be anything from benign and cosmetic to devastating, irreversible blindness. Cholesterol plays an important role in human tissue; it is a component of cell membranes and the precursor for the manufacture of steroids and other hormones (chemical signals used for a wide variety of bodily functions) and it is important in the production of bile, an acid used in the digestion of fats. However, too much cholesterol—specifically, too much Low Density Lipoprotein (LDL)—can have devastating consequences to both systemic and ocular health. High Density Lipoprotein (HDL) is used to carry cholesterol from artery walls to the liver and is thus often considered the “good” cholesterol, while LDL transports cholesterol to artery walls and body tissue. For this reason, elevated LDL levels are considered a risk to health, as cholesterol buildup can narrow arterial walls, and parts of a cholesterol plaque can break off and block smaller arteries downstream, leading to a loss of function of the area supplied by the affected artery. When this artery is in the heart, it can lead to a heart attack. In the brain, it is a stroke. And in the eye, it is referred to as an retinal artery occlusion. One ocular sign of high cholesterol is a bluish ring that forms near the outside of the cornea, the otherwise clear, front part of the eye. These rings, called “arcus senilis,” appear most commonly with age as more cholesterol gets deposited into the cornea. Arcus senillis is benign and does not interfere with vision, however it may signal high cholesterol; if you or a family member shows this sign, it would be prudent to get a lipid panel test from your physician. Another sign are small, soft, yellowish elevations of skin above the eyes and near the nose, called xanthelasma. These are also benign though they can (but not always) indicate high cholesterol. One sign that is very serious and potentially blinding is a plaque observed inside one of the small arteries within the eye, known as a Hollenhorst plaque. This is a buildup of cholesterol that has broken off from a clot “upstream,” usually from a much larger artery such as the carotid artery. The plaque in the eye will block the flow of blood further “downstream,” therefore occluding that artery and causing death to the tissue that is fed by that artery. This is called a Branch Retinal Artery Occlusion (BRAO)—or if the main arterial supply to the retina is blocked, a Central Retinal Artery Occlusion (CRAO). All the cells in our body need oxygen to survive, and your arteries are the highways that carry the oxygen. If these “highways” are blocked by cholesterol plaques, blood doesn’t reach the tissue it was heading for, and thus oxygen doesn’t, either. This results in a quick (within hours) and irreversible loss of function, which could include blindness of the affected eye depending on the location of the blockage/occlusion. An artery occlusion is essentially a “stroke” within the eye. Worse still, the presence of a Hollenhorst plaque increases the likelihood that a plaque could also find its way to the brain. If a small blood vessel that feeds a part of the brain is occluded, this is known as a “stroke,” which could result in loss of vision, loss of sensory or motor control, loss of speech or memory and even death, depending on what part of the brain was affected by the loss of blood flow, resulting from the cholesterol plaque. There are medical treatments to reduce cholesterol levels and others to “thin” the blood to reduce clotting potential, and surgical treatments are available to remove or bypass cholesterol plaques that put a patient at risk for stroke. 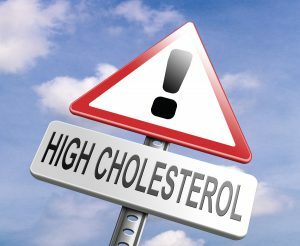 Early detection and treatment of high cholesterol can help avoid potentially blinding or otherwise sight-threatening–and even life-threatening–conditions! The eyes are the only place in the human body where actual blood vessels can be observed without the need to cut into the body or take special images. As such, examination of the retinal vasculature can lead to the diagnosis of a variety of systemic conditions, including diabetes, hypertension and as was discussed here, high cholesterol, too. 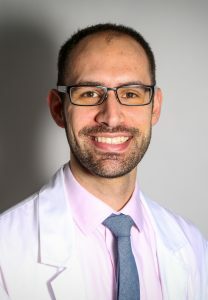 Dr. Matthew Bovenzi is an assistant clinical professor in the University Eye Center’s primary care service. He is also a supervisor in the glaucoma clinic.